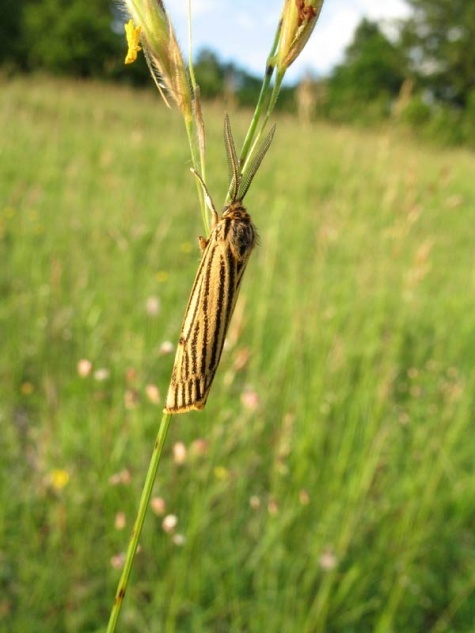 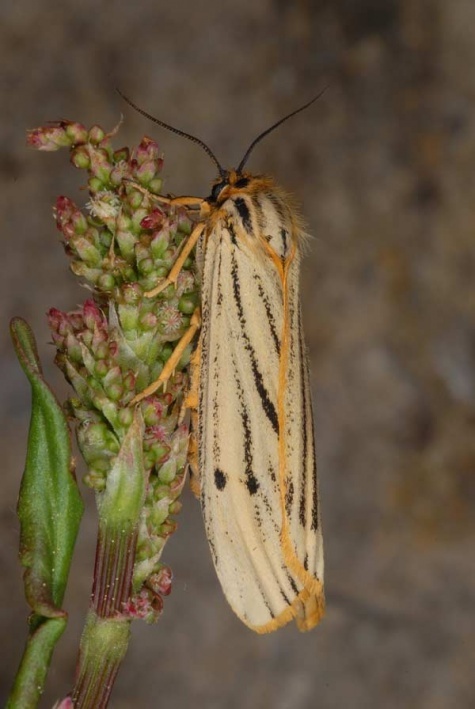 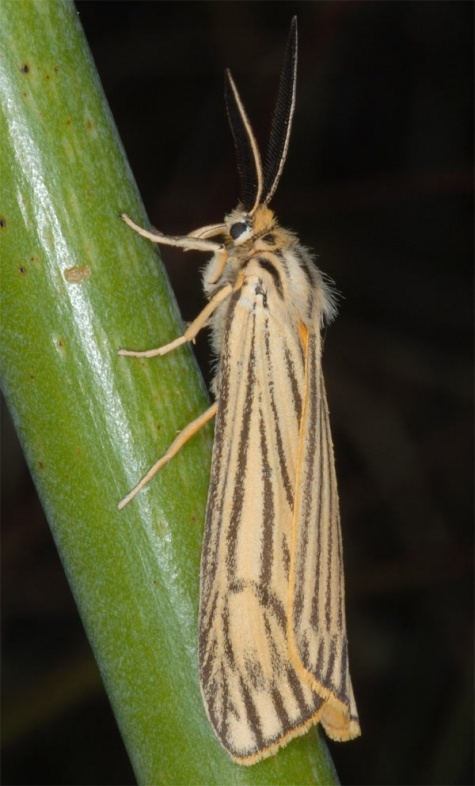 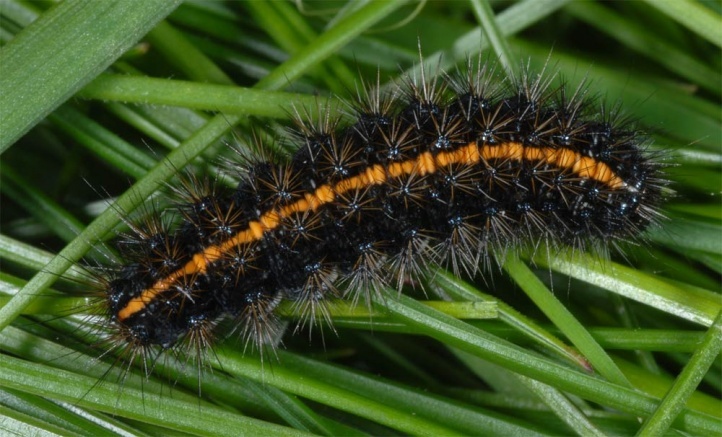 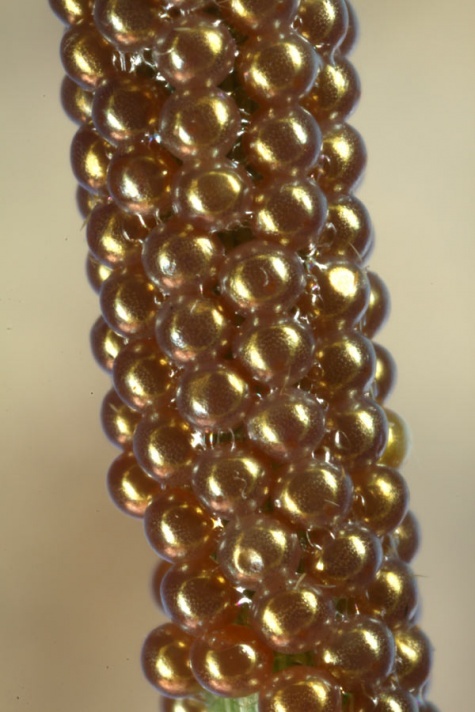 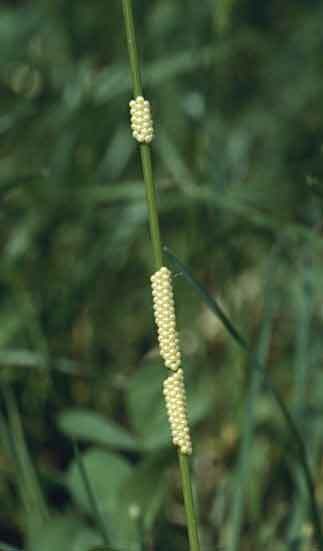 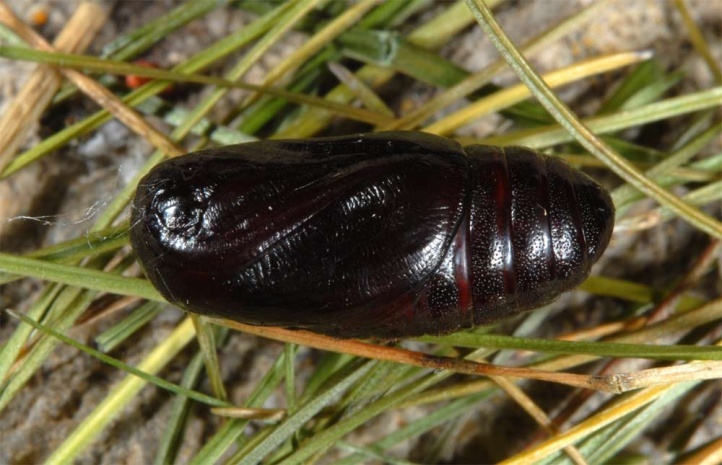 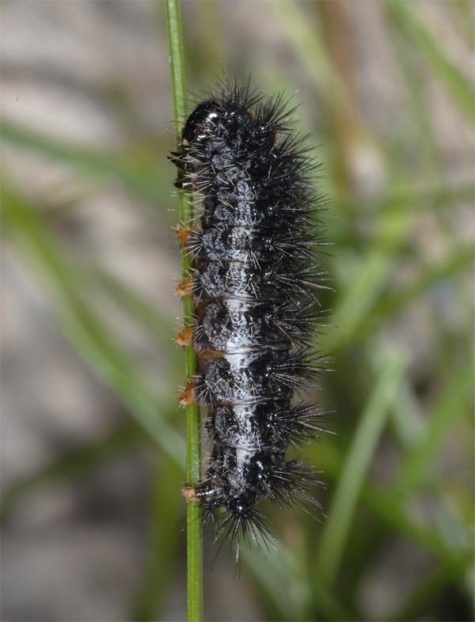 The species is polyphagous, but in the very first place the larva feeds on grasses (Poaceae) such as Bromus erectus and particularly Festuca ovina agg. 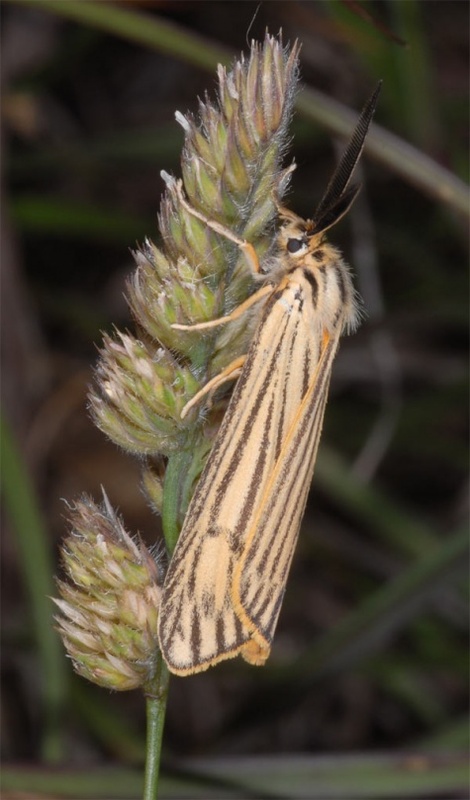 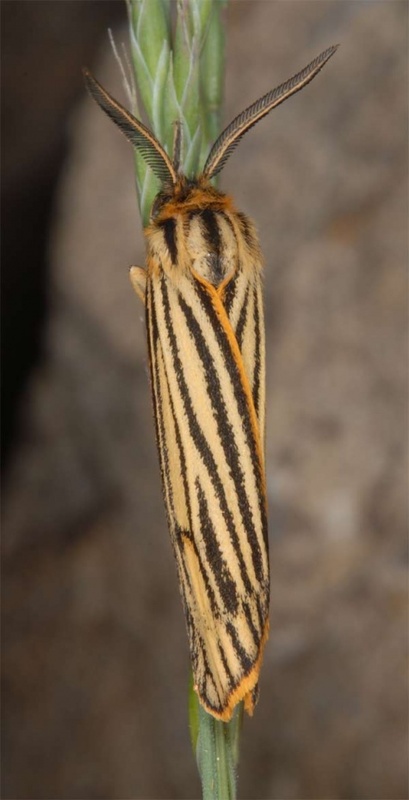 Spiris striata inhabits sandy areas and nutrient-poor grasslands. 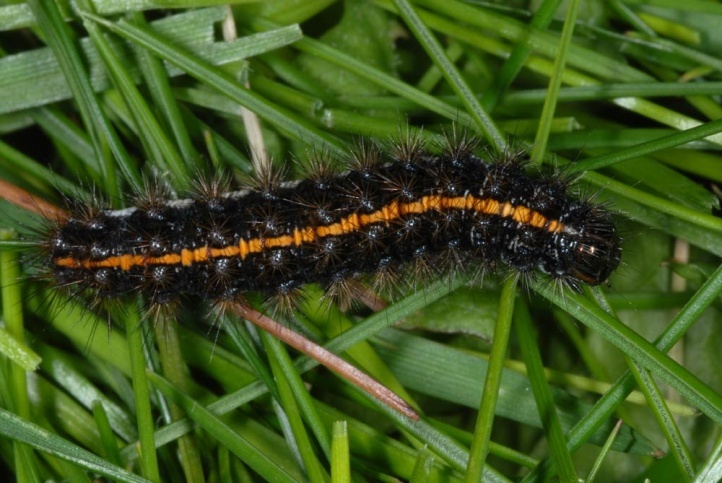 In their respective habitats, the caterpillars are very fixated on the most meagre and most scarcely vegetated places. 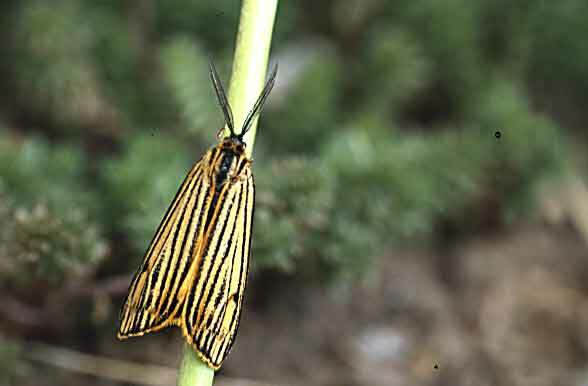 Spiris striata is rapidly disappearing if vegetation is closing and growing higher (e.g., after abandonment of grazing), but also if the habitat is grazed by keeping the sheep in pens. 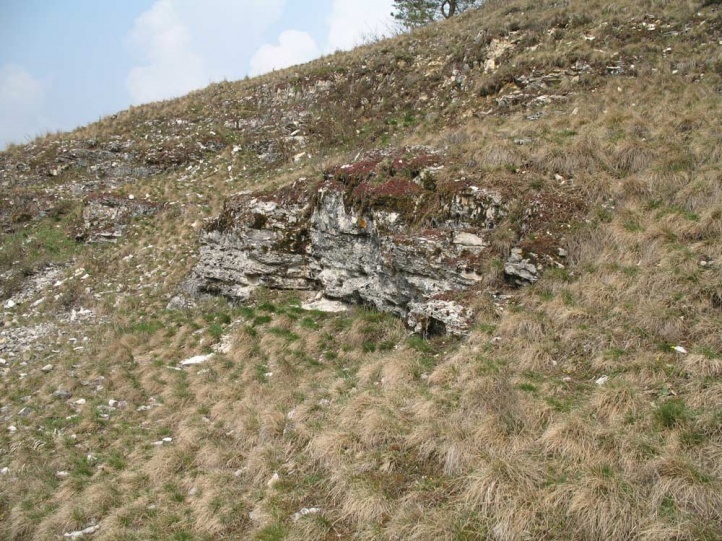 In southern Europe the habitat spectrum is broader and partially shifted to the more mesophilic side. 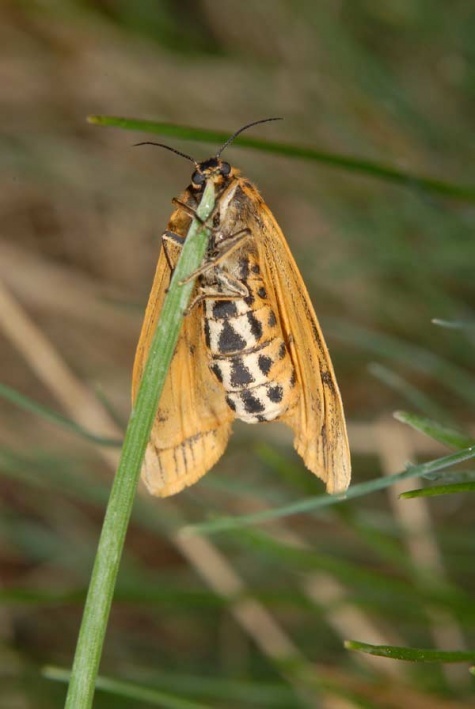 So I found moths on Mount Phalakro (Drama, Greece) on a fresh pasture at 1600m above sea level and in Andalusia on seasonally humid pastures with Brenthis hecate. 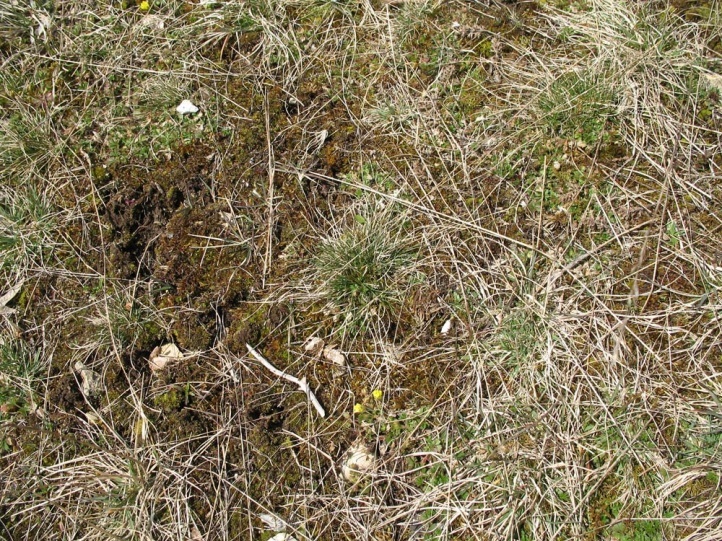 On the foothills of Mount Olympus (200m above sea level) I observed adults on a very dry steppe pasture already in mid-May 2010. 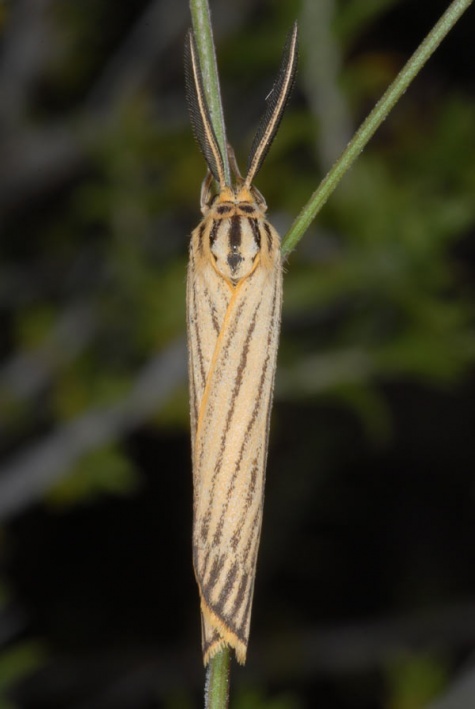 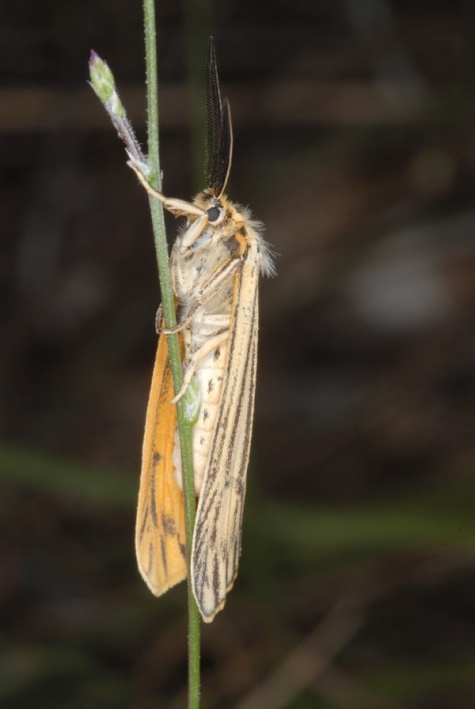 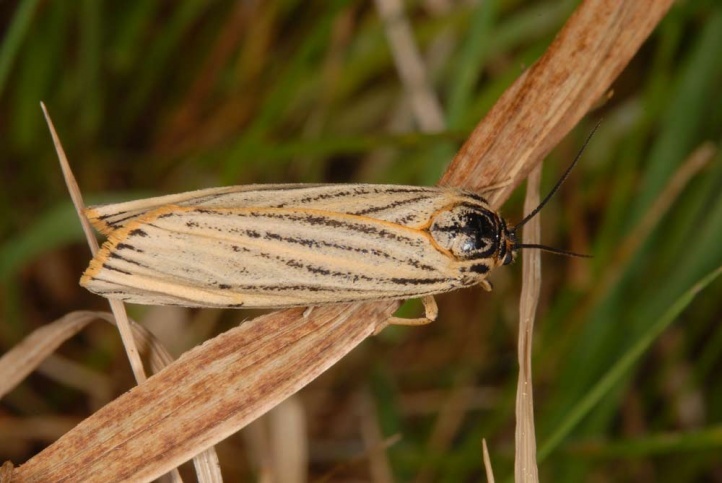 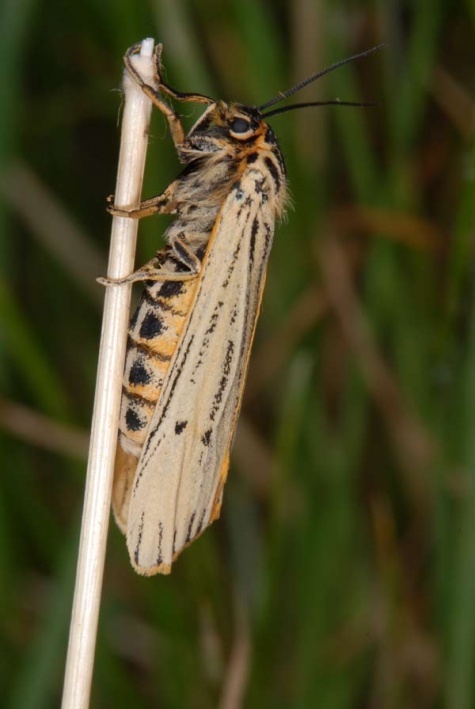 In Provence, Spiris striata is quite common in almost all dry grasslands and also in very bright oak forests with grassy clearings. 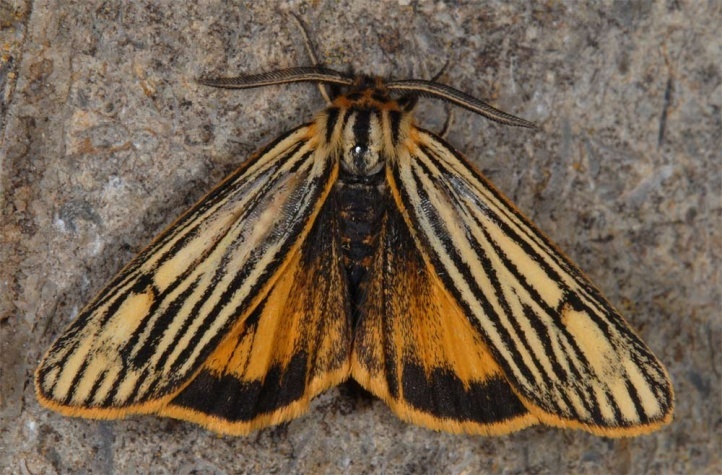 The moths fly in one generation in June and July. 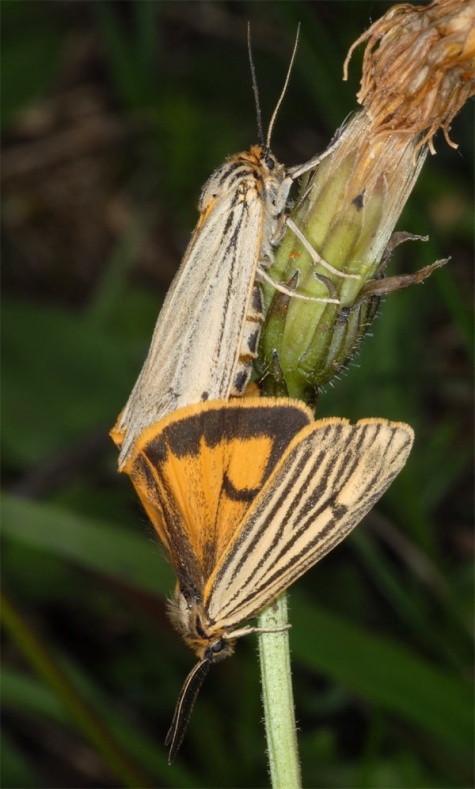 In the lowlands of Southern Europe there are partly two generations (May/June, August/September). 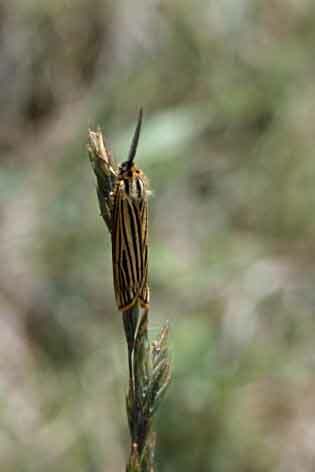 The males often rest on grass flowers or blades and are easily flushed. 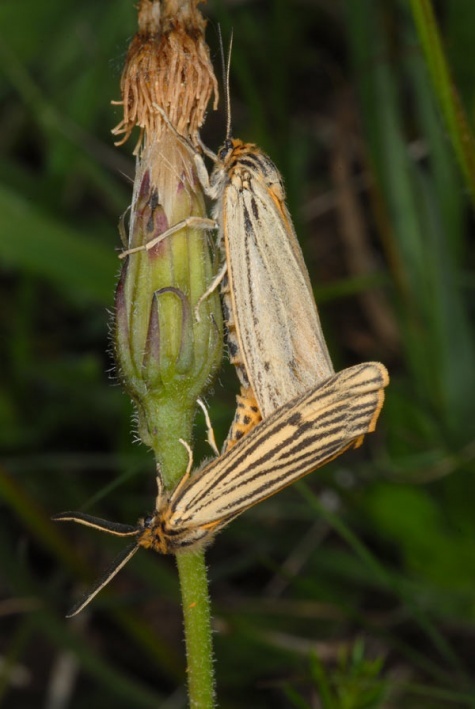 But then they generally rest in similar positions a few meters further again. 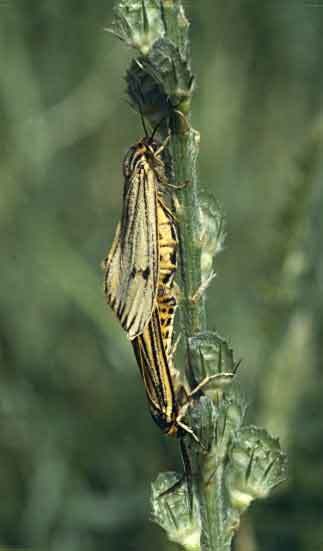 The males patrol sometimes for longer times in their habitat in order to locate virgin females. 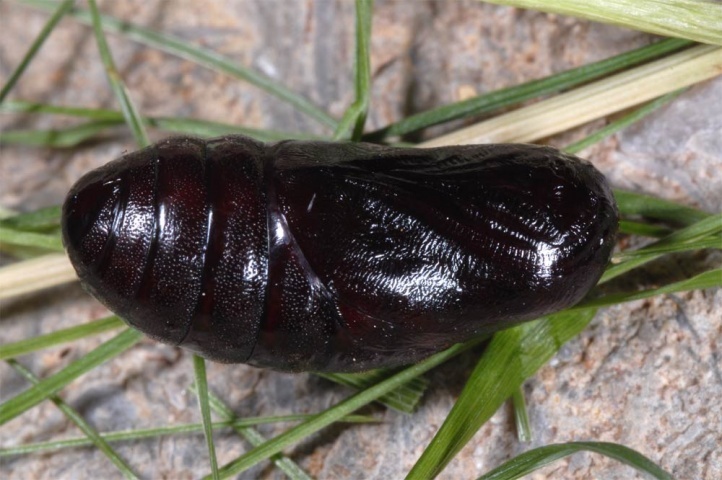 These are much more idle and usually get fecundated only a few minutes after emergence out of the pupal skin. 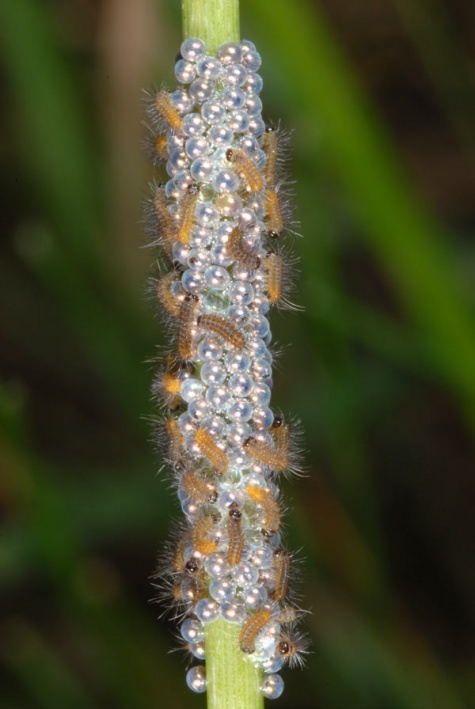 The eggs are deposited in larger clutches on blades. 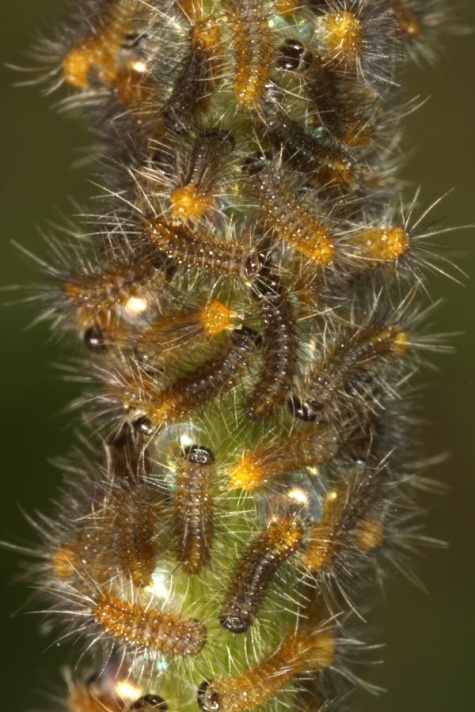 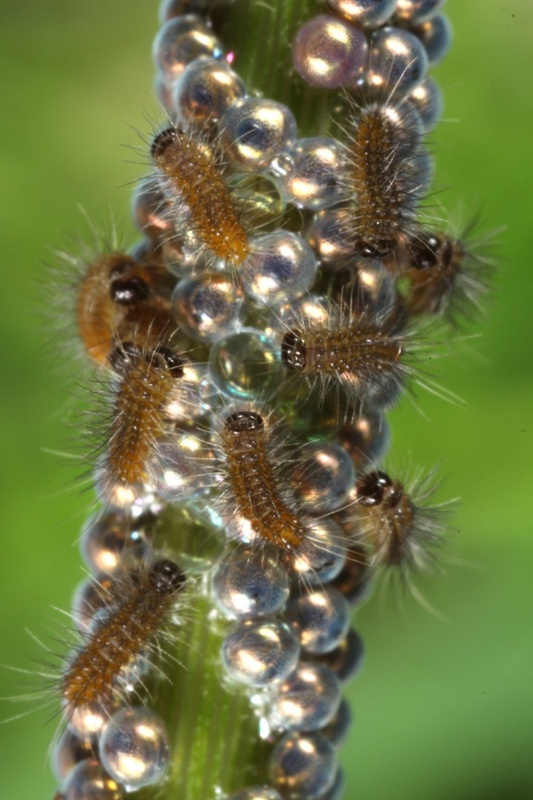 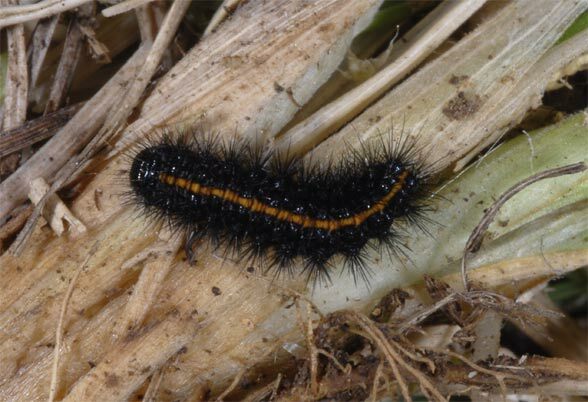 The caterpillars live quite hidden in the low vegetation at first but change their behaviour from the beginning of October. 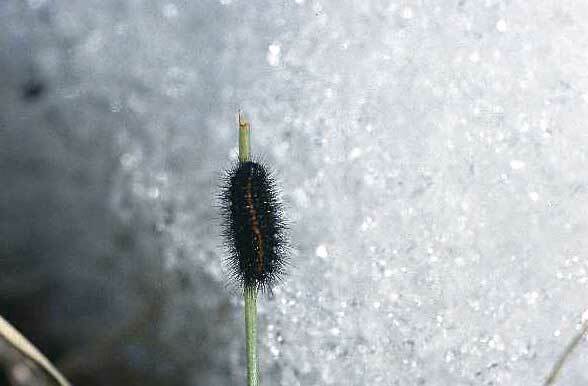 Then they sit openly close to the ground or elevated on stalks, etc., where they are even to be found when it is snowing. 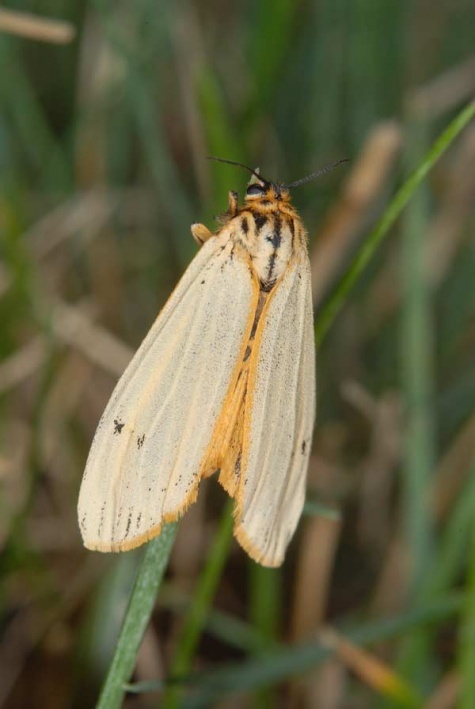 After hibernation, approximately from late april in central europe, they return to a more hidden behaviour again with the increasing solar radiation and thus to watch better in the early morning. 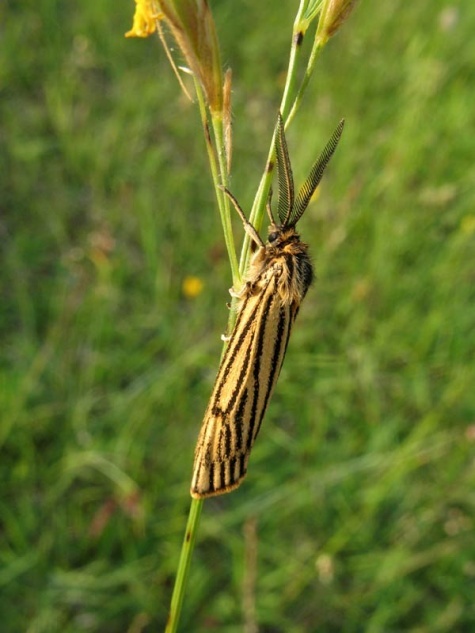 Spiris striata is endangered and rapidly declining in Central Europe due to general eutrophication, abandonment or reduction of grazing in juniper heathland or other grasslands, loss of habitat through reforestation, overbuilding, quarrying using modern methods and bush encroachment., Spiris striata is rapidly declining. 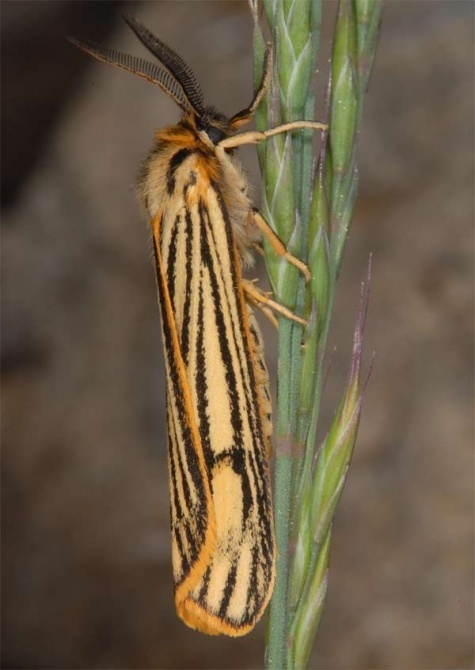 Especially the sandy grasslands populations also have to struggle with potential integration of their habitat into agriculture fields (growing asparagus and other specialty crops). 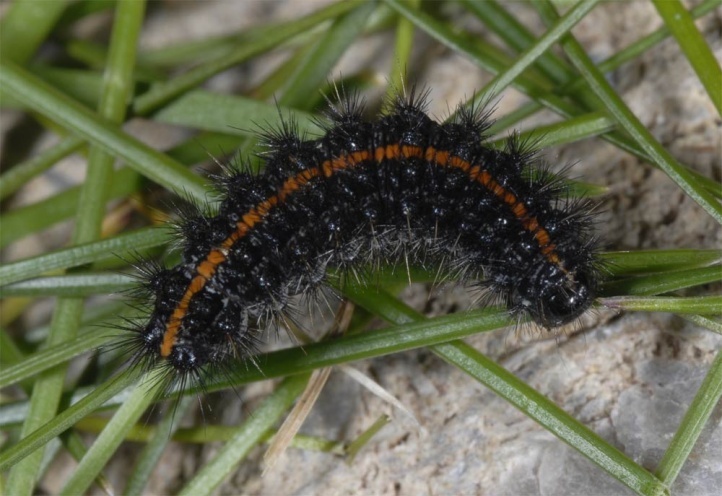 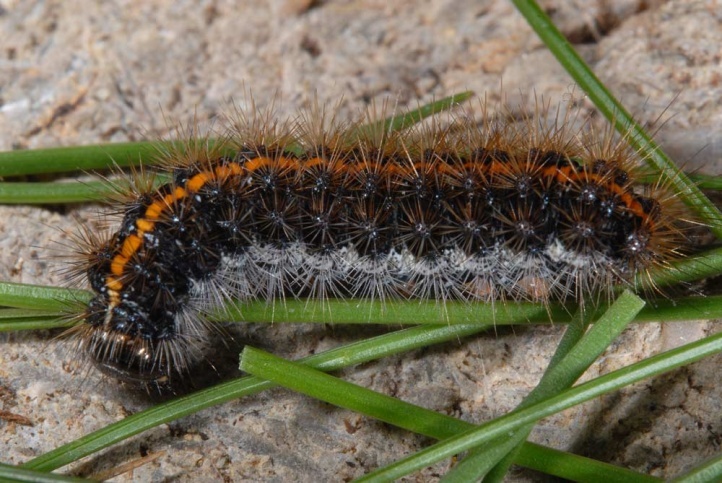 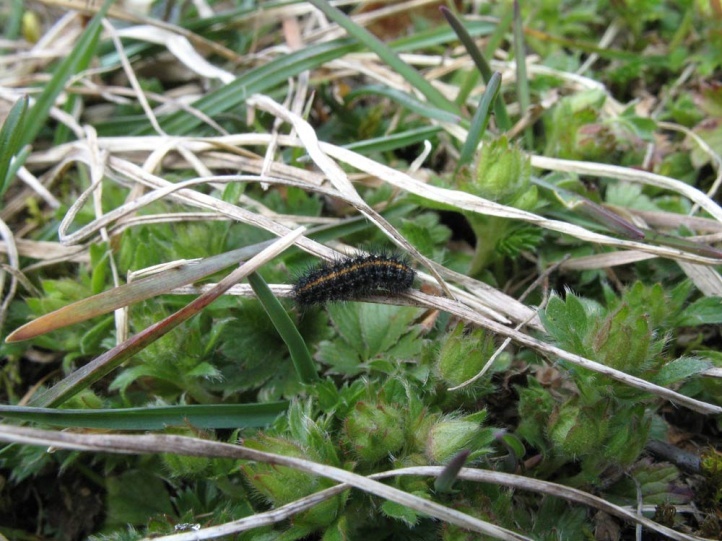 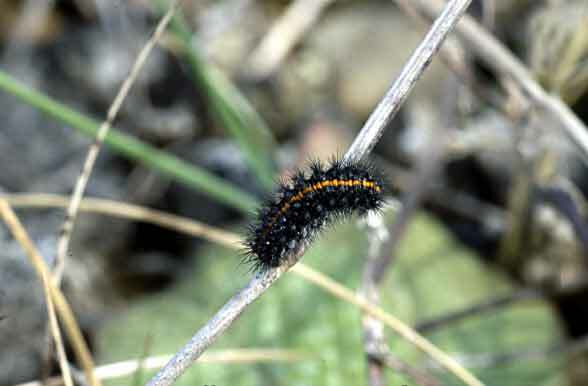 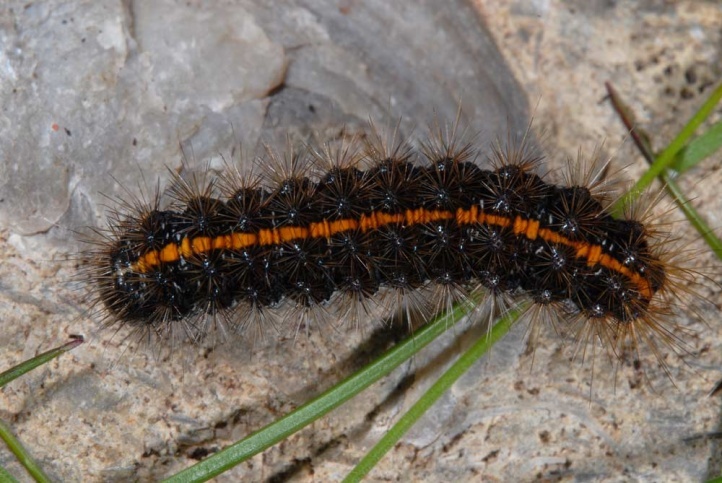 For species detection the search for caterpillars is to recommend, which is convenient to carry out the winter months. 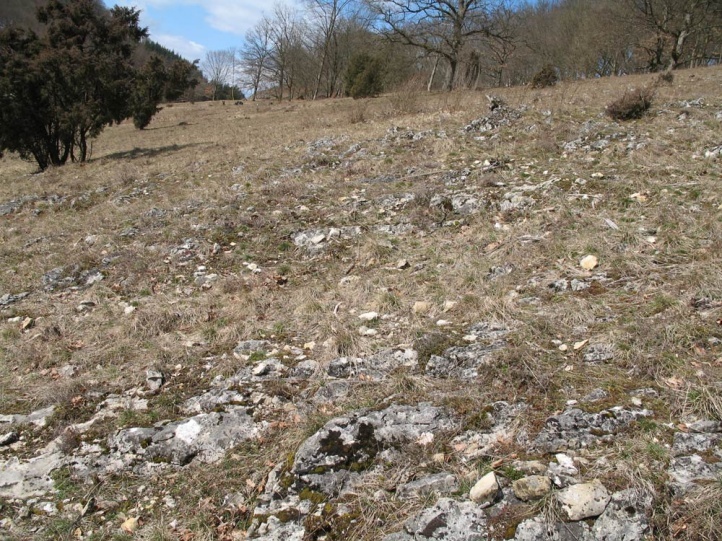 The total distribution is largely confined to Europe, ranging from the Iberian Peninsula to the Baltic Sea and from Southern Scandinavia to Greece (in Northern Greece very common).